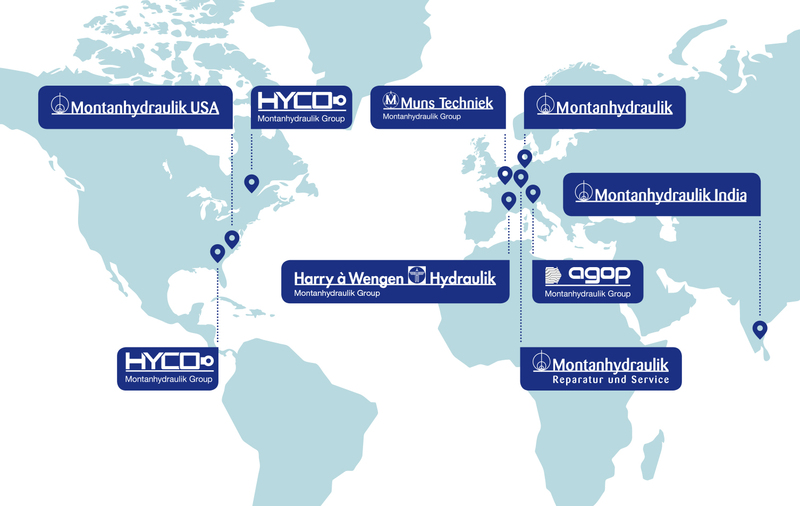 With 12 locations and more than 1,200 employees worldwide, the Montanhydraulik group is among the top addresses for hydraulic cylinders and hydraulic systems. As an international group of companies, our locations include Germany, Italy, India, the Netherlands, Canada, and the USA. Every company in the production network possesses specific knowledge and skills which benefit the customer thanks to the close collaboration within the group of companies. This applies not only to new concepts, but also to the optimisation and further development of the product range, and also to ensuring delivery performance. A close identification with the requirements of customers who are internationally active is the guarantee for continuity, reliability, and trust. Our code of values is a significant component of our compliance, and is supported jointly and embraced consistently by all employees. Transparent, flexible, and efficient business processes throughout the length of the value creation chain ensure for the long term the excellent reputation as a skilled and reliable business with a powerful mission. Since 1952, the history of Montanhydraulik has been characterised by permanent growth. A success which did not just come from out of the blue, but which instead is based upon far-sighted entrepreneurial decisions and the development of innovative solutions. In the same way, the decision to purchase or found companies was based on the recognition of chances which presented themselves, as well as on the strategic vision for the growth of the company. In this respect, our locations also reflect the development of the Montanhydraulik group. All our locations are connected by the high quality which characterises our hydraulic cylinders and which permeates our entire process chain as a constant requirement. All our works have appropriate certification, but this is far from being enough for us to guarantee a maximum level of quality to our customers. We use modern machine tools, welding robots, automatic installation and testing equipment, galvanisation equipment, and special machinery which was further developed to our requirements from standard machinery. However, the highest quality is not merely a question of technology, but above all of people. We therefore continuously invest in highly qualified personnel in all areas of the company. In this way, modern manufacturing and testing technology, as well as our employees, form the cornerstones of our quality philosophy. In recent years, we have single-mindedly extended our various manufacturing locations according to their respective product focal points, and at the same time we have created very modern production plants. In this way, we achieve a very high level of flexibility, concentrate the relevant skills, and are able to optimise set-up times even for more modest manufacturing lot sizes. Our production department possesses extensive manufacturing skills which, in addition to the very modern machine park, are founded on an experienced employee base consisting of skilled workers and manufacturing specialists. Montanhydraulik’s employees, who work using the most modern computerised methods, are correspondingly well trained. They supplement their theoretical calculations by means of test rig investigations, in which both evidence of operational stability is furnished and basic research is also performed. The ever more demanding requirements for components and systems mean that knowledge about the behaviour of components and materials is a prerequisite, especially because our products are often major components of machinery and plant. For this reason, we work closely together with our customers, and we use the exchange of knowledge and experience in order to develop solutions for new application questions. The technology centre at our headquarters in Holzwickede represents the innovative force of the Montanhydraulik group. 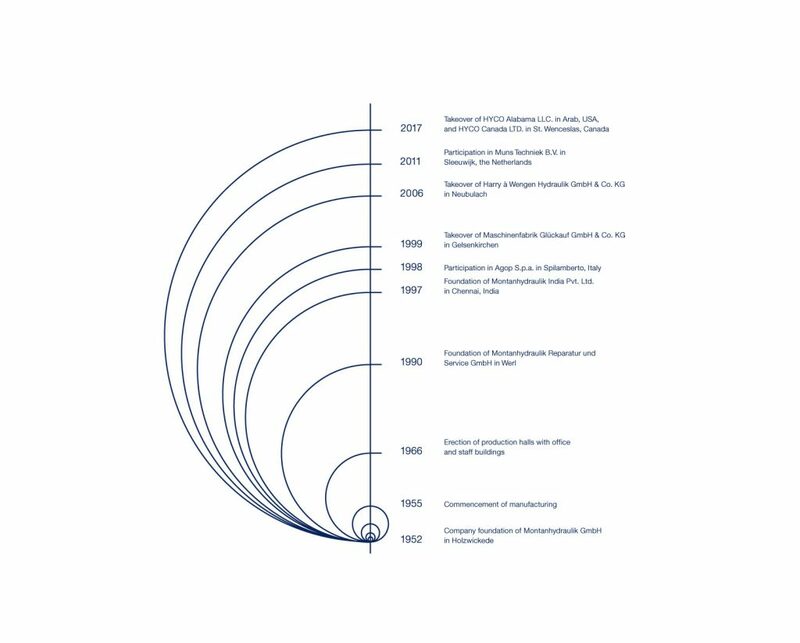 This is where the knowledge about hydraulic cylinders, gained over the decades by Montanhydraulik since the foundation of the company, is combined and applied. Research, development, and new design are combined together here under one roof, where they benefit from mutual interchange. Completely in line with our motto “Setting more in motion”, we work closely together with our customers in order to develop innovative solutions for demanding challenges. This refers above all to hydraulic cylinders which on the one hand resist high loadings and adverse environmental conditions, and on the other hand comply with tight tolerances – completely regardless whether underwater, offshore, opencast or deep mining, in the blistering heat or Arctic cold. 3-D design programs, finite element calculation programs, and calculation and simulation processes which have been independently further developed are available to our designers for the solution of complex challenges. The challenges posed to Montanhydraulik have various focal points: Weight and cost optimisation, fatigue strength, corrosion resistance, and freedom from maintenance. In order to implement the interfaces to the relevant machinery and plant of our customers, our engineers develop drive controls, highly complex control technology, integrated position sensors, and special valves. 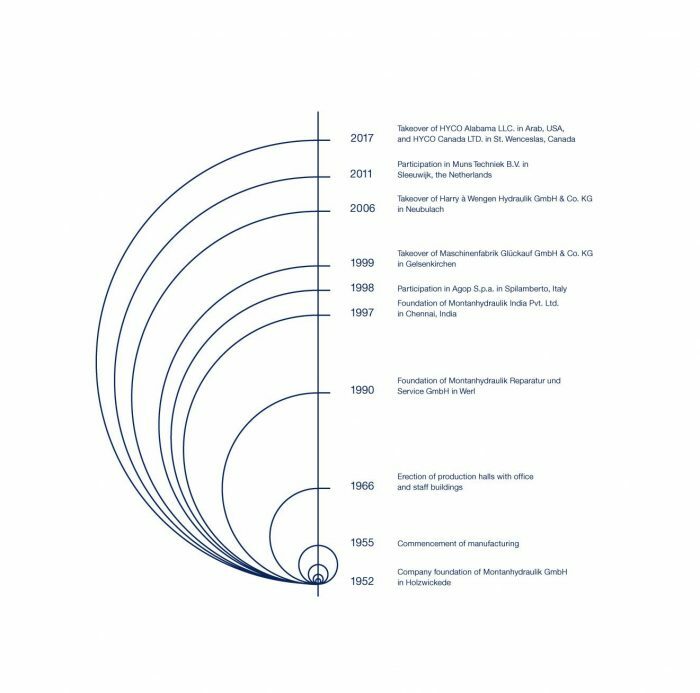 Our success speaks for us: In over three decades of development, Montanhydraulik has brought out more than 66 patents worldwide in the area of hydraulics technology. As an internationally operating group of companies with headquarters in Germany, our responsibility to people and to the regions in which we are based is taken very seriously. For many years, we have expressed our social commitment through the support of local sports teams, long term sponsoring, and cultural events. However, our responsibility towards young people is particularly close to our hearts. For this reason, we invest in their training in order to provide them with a vocational perspective. In its own training centre at the headquarters in Holzwickede, Montanhydraulik trains the next generation of skilled workers for its complex machine park. In addition, Montanhydraulik makes the necessary practical training available to engineering students, as part of their dual study for the Bachelor of Engineering or Bachelor of Arts. With a training quota of almost ten percent, Montanhydraulik offers young people a future – often extending beyond the duration of the training period: Out of the employees trained in the last ten years, around 90 percent are still employed in the company.